Plan your day - add tasks from our Suggestions or enter new tasks in My Day. Set due dates and reminder times for each task to keep everything on track. Star a task to mark it as Important and it will automatically appear in your Important smart list. Use Steps to break larger tasks down into smaller, more actionable pieces. 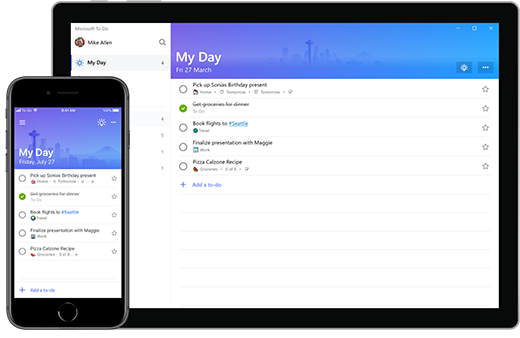 Share a list to collaborate and get things done with coworkers, friends and family. 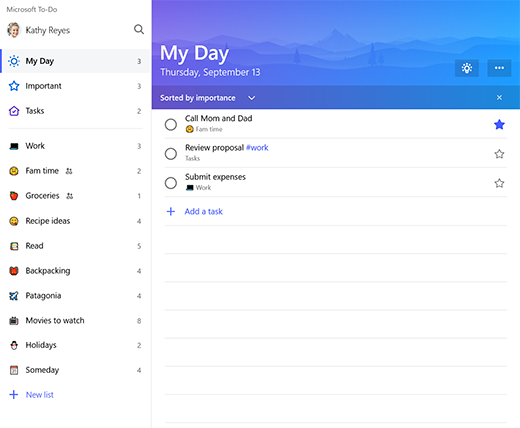 Give your tasks more context by adding notes within each task's detail view. Automatically sync your Microsoft To-Do tasks to Outlook Tasks. Access your lists and tasks from anywhere. With our iPhone®, Android™, and Windows 10 web apps, you can log in to your account on all your devices. Tap or click + New List. This creates a list with the name Untitled List. To rename it, select it and type a new name. Select + Add a task, type the task, and press Enter. Your new task is added to the bottom of your list. Tap or click the sharing icon to the left of the three dots in the top right of any list you've created. When the sharing menu opens, select the blue Create Invitation Link button. Select the blue Copy Link button. 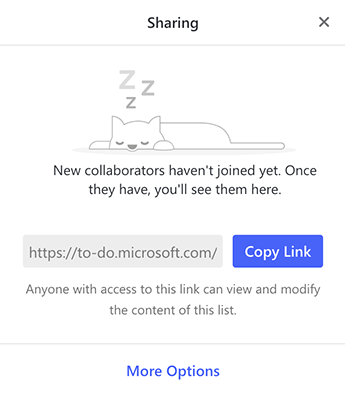 Send the sharing link to your collaborators using your favorite email or messenger app by pasting the link. Note: List sharing for work or school accounts is currently limited to members within your organization.